Docker for Mac (the native Docker implementation) does not have any special requirements for initial environment variable setup. Simply open your terminal of choice from the Launchpad (Terminal.app or iTerm.app). Docker Toolbox provides a launcher to open an environment prepared terminal, but you can also do it manually with a terminal of your choice. 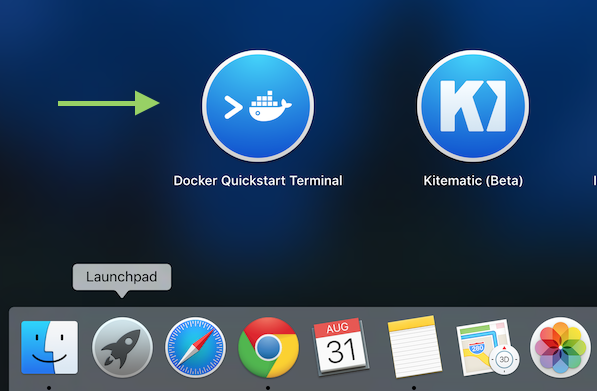 Open the Launchpad and locate the Docker Quickstart Terminal icon. Click the icon to launch a Docker Quickstart Terminal window. The terminal does a number of things to set up Docker Quickstart Terminal for you. Get http:///var/run/docker.sock/v1.19/images/json?all=1&filters=%7B%22dangling%22%3A%5B%22true%22%5D%7D: dial unix /var/run/docker.sock: no such file or directory. Are you trying to connect to a TLS-enabled daemon without TLS? Get http:///var/run/docker.sock/v1.19/images/json?all=1: dial unix /var/run/docker.sock: no such file or directory. Are you trying to connect to a TLS-enabled daemon without TLS? The Docker Quick Start Terminal is configured to use Docker with the "default" VM. You can now use this terminal window to apply all your Docker and Devilbox related commands. If you rather want to use a different terminal, you can accomplish the same behaviour.